An amazing basket of fruit and gourmet. When we tell you this design is our "Signature Series" Fruit & Gourmet basket, we mean it! If you want to astonish them with an incredible collection of fresh fruit, cheeses, crackers, sausage, salmon, chocolates, dipping sauces, dried fruits, cookies and more, then this is the basket you're looking for. 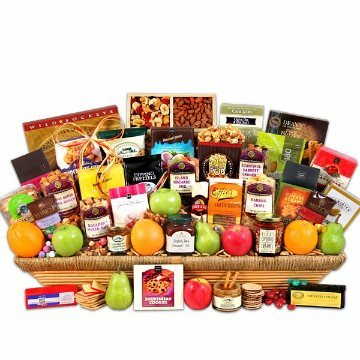 Loaded with only the finest award-winning gourmet foods and orchard fresh fruits, we guarantee that this Signature Series basket is a show stopper! This gift basket includes the following: 2 Large Green Apples, 3 Large Oranges, 2 Large Red Apples, 3 Large Pears - All fruit is flown in fresh from around the world on a daily basis. We only use the finest, gift quality fruit in our gourmet fruit baskets. Deli Style Hors D'oeuvre Crackers 2 oz, Hickory & Maple Smoked Cheese 8 oz, Classic Vermont Sharp Cheddar 8 oz, Smoked Sausage 7 oz, Smoked Salmon Red and Gold Gift Box 8 oz, Oatcake Biscuits 7.2 oz, Dipping Pretzels 6 oz, Raspberry Peach Champagne Jam 3 oz, Raspberry Honey Mustard Pretzel Dip 7.8 oz, Cinnamon Honey Dipping Pretzels 6 oz, Cinnamon Bun Caramel Sauce 5 oz, (8) Hillside Candy Assorted Sugar Free Fruit Candies, Pure Butter Shortbread Fingers 4.6 oz, Parmesan Artichoke & Garlic Cheese Straws 2.5 oz, Boulder's Mixed Nuts 4 oz, Bountiful Harvest Granola 8 oz, Island Orchard Mix 8 oz, Banana Chips 4 oz, Chocolate Dipped Toasted Coconut Moravian Cookies 8 oz, Caramel Nut Crunch Popcorn 6 oz, Meyer Lemon Moravian Cookies 5 oz, Raspberry Powdered Cookies 2.5 oz, Almondina Biscuits 4 oz, Pistachio Trail Mix Crunch 3 oz, Pear Cinnamon Caramel Sauce 11 oz, Peanut Butter Pretzel Nuggets 4 oz, Mendocino County Gift Crate (dried fruit and nut mix) - 33 oz, Chocolate Chip Walnut Cookies 6 oz, Cheddar & Chive Flatbread Crackers 6 oz, Chocolate Covered Cherries and Blueberries 4.5 oz, Chocolate Covered Cherries 2.3 oz, Holland Mints 2.1 oz, Chocolate Chunk Shortbread Cookies 2 oz, Roasted and Salted Peanuts (gold trim box) 7 oz.